After the Vienna Agreement (2 November 1938), when Carpathian Rus' was annexed to Hungary, the city of Sevluš remained in the autonomous Ukrainian Republic. The disruption of rail communications between Sevluš and the hinterland caused severe shortages. On 15 March 1939, the Hungarians invaded and they confiscated the lands and invalidated commercial licenses of the Jews. The community organized a bureau for the protection of Jewish civil rights and its leading members were Moshe GUTMAN (Zionist) and Lipa FRIEDMAN (Chasid) and the secretary was Dr. Mordechai NICHOMOVITZ. The bureau became a branch of Omzsa (a Jewish relief organization) whose center was in Budapest. They organized occupational courses and opened a communal kitchen for the needy. From 1941, men were drafted into the Hungarian Slave Labor Battalions. At this same time, Jews without Hungarian citizenship were sent to Kamenetz-Podolsky in the Ukraine. Among the 18,000 Jews in the camp there, several score were from Sevluš. and its vicinity. 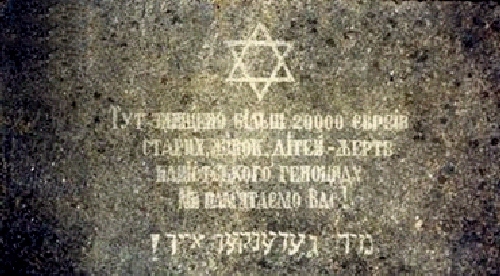 Most of the Jews in the camp were murdered by Ukrainians on the orders of the German S.S. guards. From 1941 until 1944, the Jews of Sevluš and the area lived under difficult conditions and were subject to harassment, but nevertheless, Zionist activity continued under the guise of Scouting. On 19 March 1944, the Germans invaded Hungary and forced the Jews to organize a Judenrat (Jewish council). In Sevluš, the council members were Mendel WUERZBURGER, Lipa FRIEDMAN, Moshe GUTMAN and others. On 7 April 1944, Carpathian Rus' was declared an operational area and an ordinance, 6163/1944 BM res., was outlined by László Endre, state secretary in the Ministry of the Interior, responsible for the plan to make Hungary Judenfrei (free of Jews). On the last day of Passover, on 19 April 1944, the German Nazis arrived in Sevluš and the surrounding areas. Without warning, the remaining Jewish families living there and from the surrounding areas of Ugocsa and Halmi districts—approximately 14,000 in all—were rounded up and moved into the ghetto in the vicinity of the communal building in Sevluš where they were interned. They suffered severe interrogations, physical abuse and the living conditions were horrible. The wealthy Jews were taken into the synagogue where they were tortured in order to disclose the hiding places of their valuables. The Hungarian Baron Sigmund PERENYI helped the Jews in the ghetto. 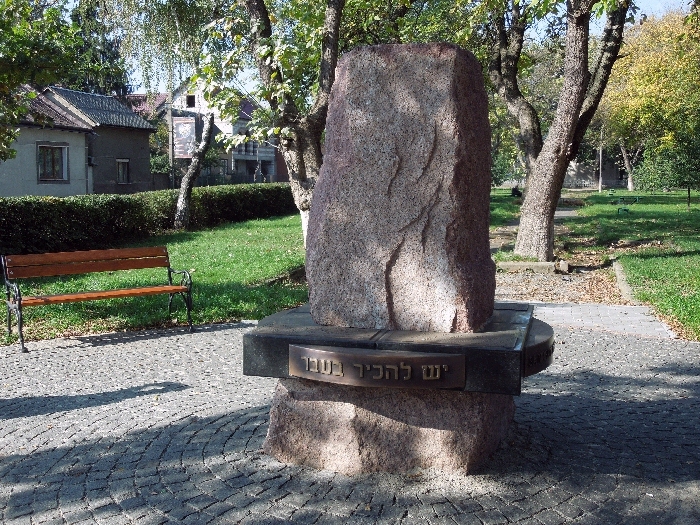 During the period 20 May to 3 Jun 1944, the Jews in the Sevluš ghetto were forced into railroad cattle cars—70 to 80 to car—then transported by train to Auschwitz in three transports. Moshe GUTMAN, the community leader, choose to stay with his people and was among the first to be deported though he was offered a chance to escape to Budapest. Two additional groups of deportees were sent to Auschwitz and arrived there between the seventh and thirteenth day of Sivan. A few members of the "Ha'Shomer Ha'Zair" and some other Jews were able to hide and survive. A local underground group was uncovered by the Germans, its members arrested and faced court-martial. Among them were eight Jews, Dr. Yacob LEIZMAN (one of the organizers of the group), the FARKASH couple, the LEIBOWITZ couple, the SCHWARTZ couple, Shmuel WEISS (from Fekete-Ardo) and three non-Jews. They were all executed by firing squad on 17 June 1944. In 1945, after the war, a public memorial service was held for Dr. LEIZMAN and his comrades, the victims of Nazism. 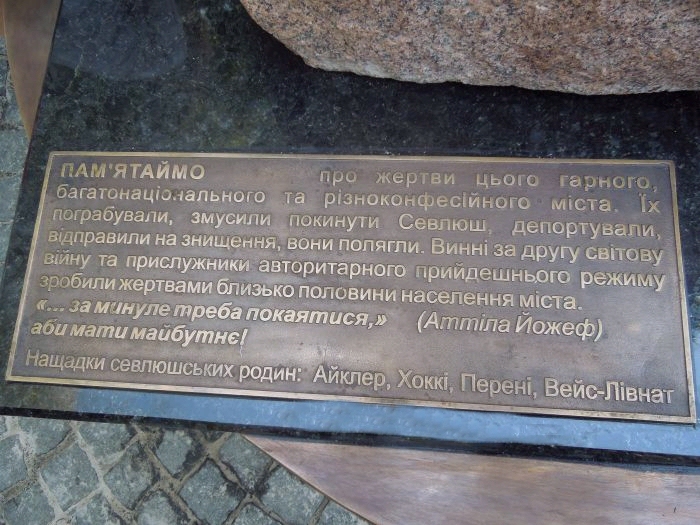 A monument was erected in their memory in the center of the town. 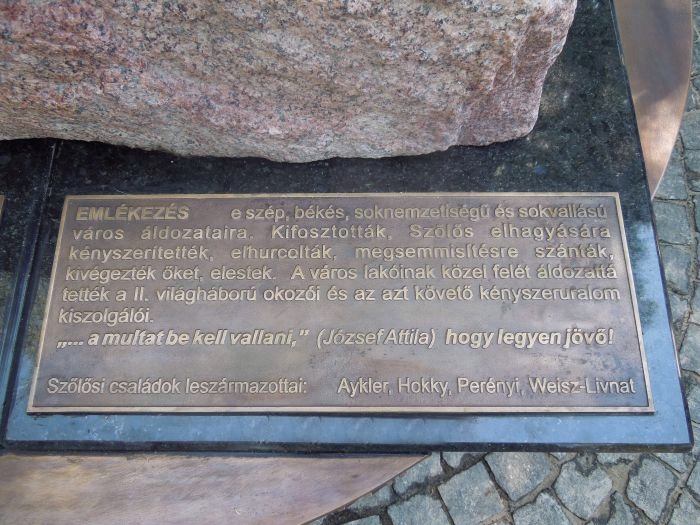 The Holocaust memorial in in four languages: Hebrew, Hungarian, Rusyn and Ukrainian—see the following plaques. 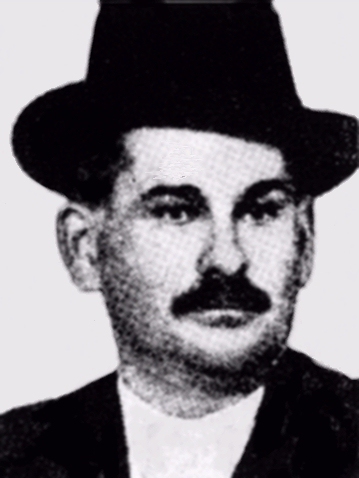 Moishe FARKOSH (pictured right) was one of eleven members of the underground executed by the Hungarians for spying for the Russians. Early in 1944, the Russian army was pressing towards the west and was approaching Szőllős when a Russian agent was parachuted into enemy territory nearby Szőllős and was injured when he landed in a farmer's field. A pro-Russian farmer found him and brought him to the house of Dr. Mordechay NOCHUMOVICH (later, a Shoah survivor who died in 1970, in Los Angeles, California). Dr. NOCHUMOVICH then bought the Russian parachutist to Dr. LEZSMAN, also the Rosh Hakohol (Head of the Jewish community) of Szőllős. After the agent recuperated, he went to collect the addresses of relatives of captives who originated from Szőllős. They made a pact to help the Russian agent and Dr. LEZSMAN started to cooperate with the agent. The Russian agent was hidden in a secret shed next to Dr. LEZARS's house and through his office, information was given on the movements of the Hungarian army. After a while, Dr. LEZSMAN felt that the Hungarians were following him and the office was moved to the outskirts of the city. However, the Hungarians found that location and arrested a non-Jew who was involved in the underground. The Hungarians tortured him until he gave out the names of all that were involved with the underground movement. 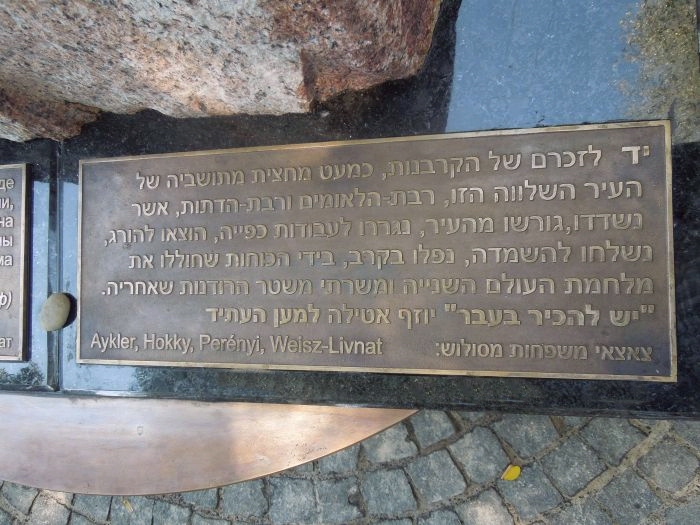 The people that were identified in the underground were executed on 17 June 1944 in the center of Szőllős and included: Dr. LEZSMAN, Moishe FARKASH and his wife, Henye; Yakov LEIBOVICH and his wife, Devoire; Moishe SCHWARTZ and his wife, Helen; and Shmiel WEISZ, who had a wheat mill, plus 3 non-Jews. 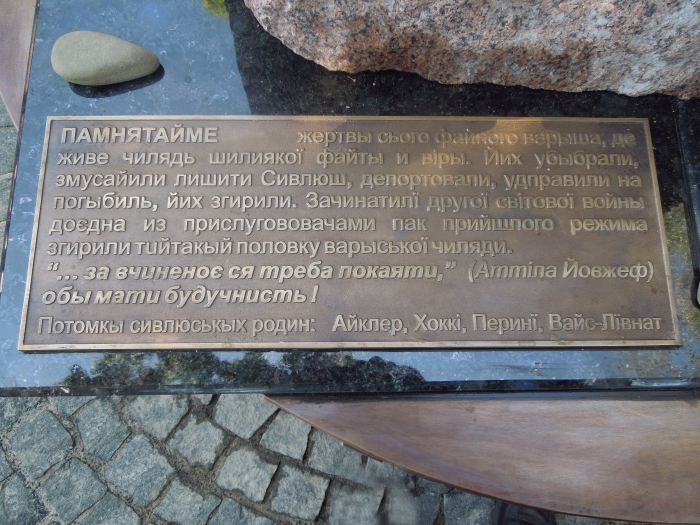 After the city was liberated by the Russians, those murdered were given a official funeral and a monument (pictured right) was erected in their memory. Aharon FARKASH; Sandor BERKOVITZ and Alex KISS and another three non-Jews were put on trial and were sentenced to 15 years in prison. Disclaimer: The following names were found searching the Nevek-Klarsfeld web site for individuals born in or last known address of Nagyszollos. Duplicate names may or may not be the same person. Unfortunately, for reasons unknown, the list is incomplete.